Gwyneth Thompson-Briggs is a contemporary sacred artist in the perennial tradition of Western sacred art. She is dedicated in particular to reviving techniques from the Renaissance and Baroque eras to reveal the glory of God in the midst of today’s ecclesial and civilizational crises. Her art decorates churches, schools, and private homes throughout the Americas and Europe. 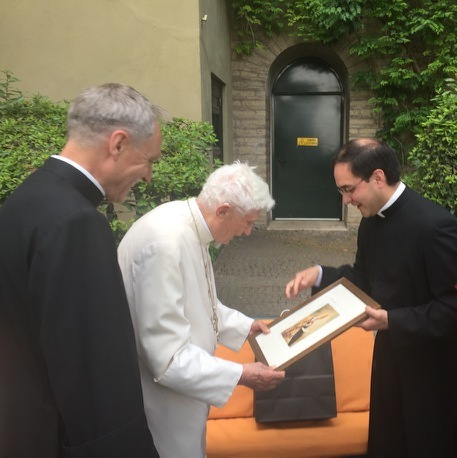 In 2017 she was asked to create a painting for Pope Emeritus Benedict XVI. During high school, Gwyneth studied under Tony Ortega at the Art Students League of Denver. She went on to earn a BFA at the Rocky Mountain College of Art and Design. Gwyneth also holds advanced degrees in Physics and Engineering from the Colorado School of Mines. She taught college-level math for eight years, including two at the Colorado School of Mines, while continuing to study drawing and painting independently. In 2014, Gwyneth moved to New England to study the Boston School technique under Paul Ingbretson, and began to dedicate herself full-time to art and design. She was Visiting Fellow and Artist-in-Residence at The Thomas More College of Liberal Arts in Merrimack, NH, where she and her husband developed a year-long core course in the perception, practice, and theory of sacred art. Gwyneth lives in St. Louis with her husband, Andrew, and their two children.